The Council's second episode doesn't manage to hit the highs of the first, which could be down to it being smaller in scale in comparison. Hide & Seek's murder mystery does bring you in and advances the overall plot in a big way, but at the same time it feels like more could have been made of it. The Council: Episode 2 - Hide and Seek shifts the focus from balanced gameplay of the first part to investigations and puzzles, and pushing political intrigues and communication with famous historical figures to the third place. Variability in the beginning of Hide and Seek impressed us, but ending was weaker than expected. "Hide and Seek" confirms The Council is more than a one-hit wonder. The Council Episode Two brings a lot to the excellent first episode, but some of its experiments don't pay out like they should have. The story is on point, but the puzzles needed a little more work. Despite a small handful of flaws, The Council Episode Two: Hide and Seek places an exclamation point on one of the cleverest narrative adventure games on the market. The Council Episode 2: Hide and Seek does a terrific job of building more intrigue for its fascinating story. Despite its intriguing plot and characters, Hide and Seek sadly suffers from a lack of pace. The repetitive dialogues fail to arouse the interest of the player, who'd also be annoyed by the recurrent loading times. 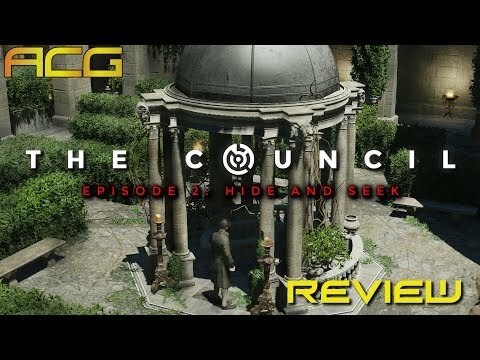 The Council – Episode 2: Hide and Seek does bring more interesting characters and puzzles into the mix, and I am definitely curious to see where The Council's plot as a whole goes from here. Sadly, Hide and Seek is ultimately a poor follow up to The Mad Ones, resulting in a short, technically flawed, and an overall disappointing episode that has killed some the anticipation I had for future episodes of The Council. The overarching story of The Council remains as eerily enjoyable as before, but the tedious puzzles that drive Hide & Seek ignore what made the first chapter such a delight to play through. After the strong start with The Mad Ones, I can't help but feel disappointed with Hide and Seek. A disappointing and buggy second chapter which sidelines much of what made the first episode enjoyable. The Council - Episode 2: Hide and Seek pushes the narrative forward but focuses on Louis exploring the island and solving large-scale environmental puzzles. With that said, the same performance issues and slowdown that plagued the first episode returns. The voice acting tends to be all over the place, even shifting quality during a single conversation. The branching paths provide a different experience, but overall the episode is quite short and once again ends on a cliffhanger. With three more episodes to come, it wasn't a surprise to discover that The Council: Episode 2 - Hide and Seek was more transitionary by design. It has its fair share of minor revelations to make, but, continuing to be hampered by the same technical issues, it's important the next episode needs to up the ante and correct some missteps before my interest in the whole spectacle falls apart. Hide and Seek, second of five episodes of The Council, tells a better story and creates more suspance. Some game moments are frustrating and many technical issues are still there: in two months, the frame rate is worse and the game remained the same. The Council's second episode, Hide and Seek, seems to do everything wrong. The puzzles are obtuse and don't make use of the game's RPG elements, the plot's forward momentum is totally killed, and it's way too short. I lapped up all the skulking, whispering skullduggery and a few of the plot twists caught me by surprise. I can't wait for more.